This resource is great for Social Skills classes to teach place setting (this section of the resource is added for FREE), support using manners, and provide practice of conversations skills while still having fun! I have also included the Chocolate Chip Cookie Giving Project. 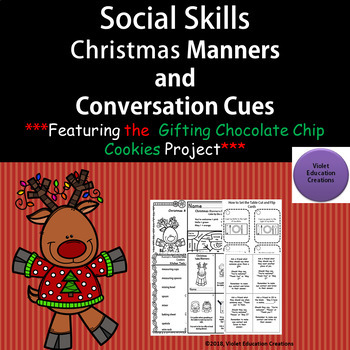 The purpose of this project is for students to bake Rudolph’s Favorite Chocolate Chip Cookies so that they can learn how it feels to give to others, use their manners, and look for facial and verbal communication cues. Included are varied recipe instructions for a diverse population of students (For example: some instructions have words, some with words and pictures), shopping list, ingredient lists, kitchen tool lists, prediction sheet before they make the cookies, and observation pages for after they have finished the gifting lesson. I’ve had such great success with students with this unit and I am so happy to share it with your classroom! ~Christmas Manners Polite Words Color by the Code coloring sheet. ~***For Free*** 1 Set of black and white “How to Set the Table” task cards. 8 task cards in a set. I also included the same set in color if you prefer it, also at no charge. 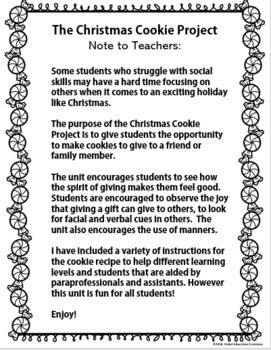 ~The Christmas Cookie Project Note to Teachers sheet. ~The Chocolate Chip Cookie project student information sheet. ~My Cookie Project Predictions worksheet. ~Rudolph’s Favorite Chocolate Chip Cookies Shopping List. ~Rudolph’s Favorite Chocolate Chip Cookies Kitchen Tool List with graphics. ~Rudolph’s Favorite Chocolate Chip Cookies Ingredients with measurements list. ~Rudolph’s Favorite Chocolate Chip Cookies Ingredients with measurements list with graphics. ~Rudolph’s Favorite Chocolate Chip Cookies Directions Page One. Words only version. ~Rudolph’s Favorite Chocolate Chip Cookies Directions Page Two. Words only version. 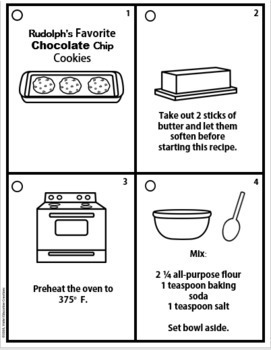 ~Rudolph’s Favorite Chocolate Chip Cookies Task Card directions version. Set of 12 cards. ~My Cookie Project Observations sheet. Version one. ~My Cookie Project Observations sheet. Version two. 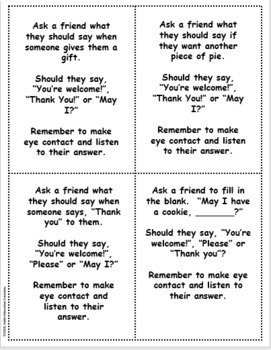 ~Conversation starters and manners practice task cards. Set of 16 cards. ~Christmas Table Manners emergent style coloring booklet. 12 frames. ~Ramona Reindeer Uses Christmas Manners story sheet with traceable vocabulary. Thank you for visiting! Be sure to follow me for updates and freebie offers! If you have any questions, comments, or issues, let me know and I would be happy to help you! Please consider reviewing my products. Enjoy!